NOTE: In a few weeks, new Purex UltraPacks detergent will also be a free sample option. If you would rather have an UltraPack sample instead, check back in a few weeks. THE FINE PRINT: Sample packets will be sent by mail in about 6-12 weeks. Samples are only available in Mountain Breeze fragrance. 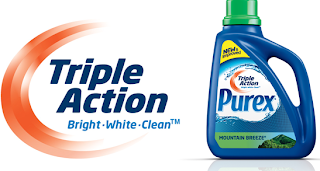 Limit one Purex sample per household per 12 months. While supplies last.